NEW - Functional and aesthetic improvements throughout—Includes the use of new, non-colorable font for chapter and subject headings, and revised presentation of the World Thematic Maps spreads. Succinct, informative, and often fascinating text or captions—Accompanies all illustrations to be colored. 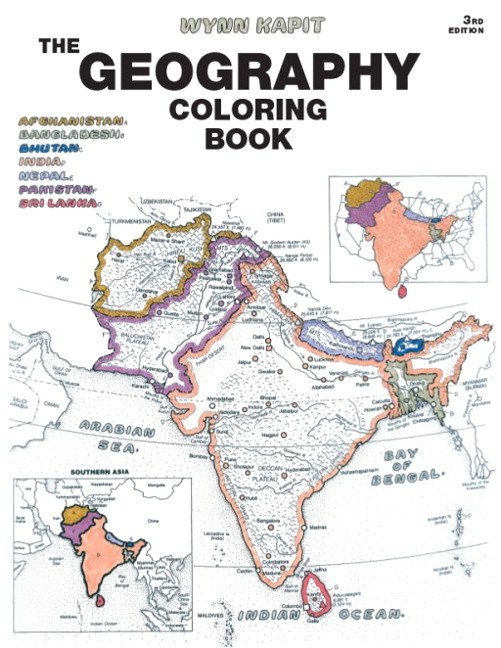 Geographical Dictionary—Each entry is followed by a brief explanation. Systematic organization of maps according to Region—With each Region introduced by a political map and a physical map of the continent. World Thematic Maps—Includes eleven global maps covering climate, rainfall, temperatures, prevailing winds, ocean currents, vegetation, land use, population, racial distribution, languages, and religions. Presents students with a “global” view of human activity. Flags and review of nations—Groups flags of the world according to continents, with the illustration of the flag placed close to the country of origin. Eight historic land empires—Including the two Islamic, presented with an extensive history of their rise and fall. Functional and aesthetic improvements throughout—Includes the use of new, non-colorable font for chapter and subject headings, and revised presentation of the World Thematic Maps spreads.